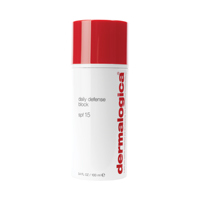 Non-greasy, non-chalky, fast-absorbing day defense. Dont face the day without this multi-tasking daytime lotion. Light-weight formula helps condition and promotes skin recovery while defending against skin-aging UV rays. Beats dryness and leaves a shine-free finish. Everyday use means healthy, great-looking skin. Contains no artificial fragrance or color. UV Smart Booster Technology provides better protection against UV-induced skin damage and aging. Antioxidant Wheat Germ, Grape Seed and Vitamin E help defend against skin aging free radicals.